As part of its goal to build a Virtual Site of Conscience, Ensaaf is creating a searchable, tagged video archive of 200 oral histories, exploring key human rights themes and survivor perspectives. We need your help to fully produce each video and get them ready for the Virtual Site of Conscience. Please help us complete the first set of videos! Each family has trusted us with their story to make their voices reach the international community. The Virtual Site of Conscience will include an immersive sensory experience, data visualizations, documentary films and video testimonials, a portrait gallery, an advocacy interface, a human rights archive, and a resource center. The video testimonials present the unique oral history of each survivor’s story. The two videos featured in this project focus on victims of disappearances. Here’s how your donation makes an impact: it costs $2500 to produce each video. Pre-production costs include field data collection, translation of free text, and writing the case summary. Production costs include travel and filming in Punjab. Post-production costs include transcription of the video, organizing the transcript and material, creating story point documents, editing, adding subtitles, reviewing the video, and incorporating feedback. Hardeep Kaur was married to Charat Singh and lives in Moga district. She describes her husband as a very “gentle” individual who took good care of her. He ideologically supported the militancy and worked as a farmer. He was 38 years old when Punjab Police stormed their home and threw him in a car. 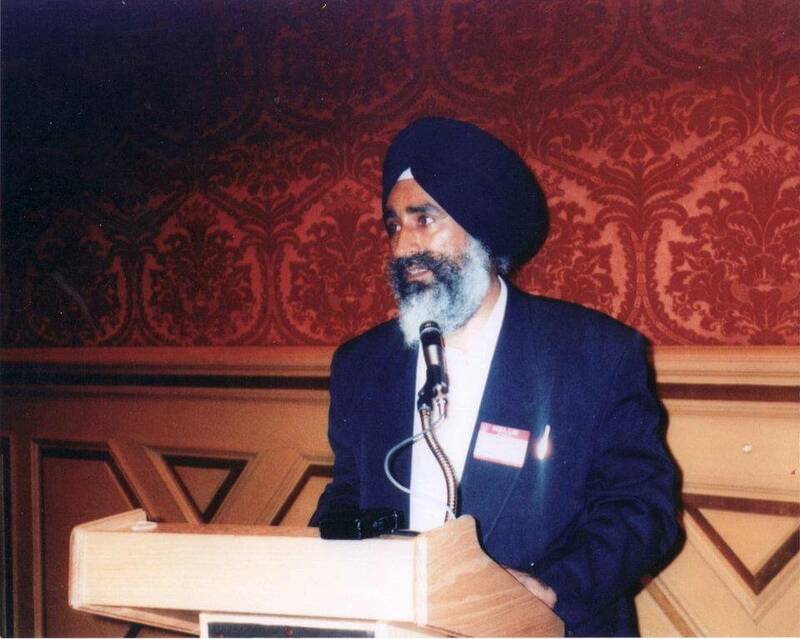 The police abducted him in March 1993, and Hardeep Kaur has not seen him since. 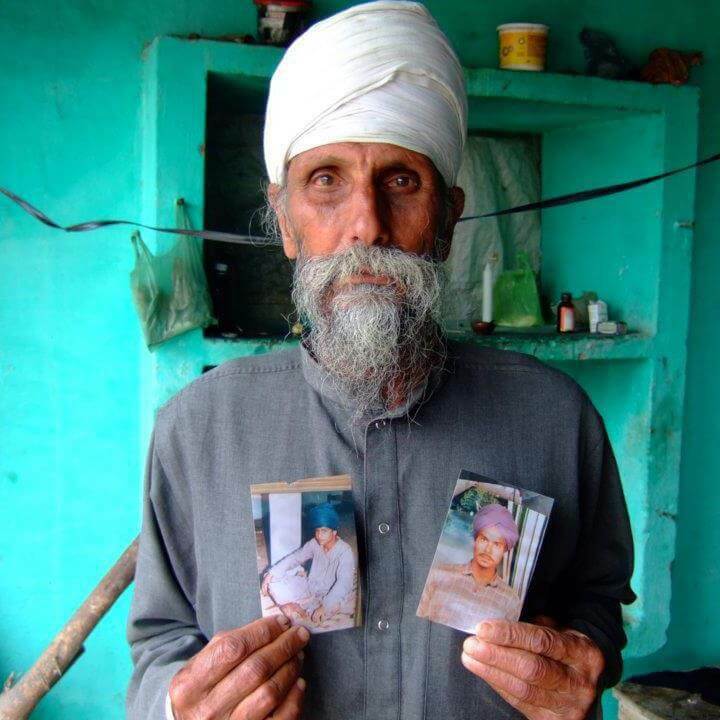 Before security forces disappeared Charat Singh, they had abducted and interrogated him 14 to 15 times. They tortured him repeatedly. Kaur says that policemen used wooden “rollers” on his body, and tore him apart at the groin. Although his condition continued to deteriorate, police persisted in abducting and torturing him. They also charged him with harboring militants and imprisoned him in Faridkot Jail for two years. In 1996, Kaur and her family filed a petition with the Punjab and Haryana High Court. She and her family had a witness who was willing to testify about the police abuse. Policemen threatened him with death if he came forward. The witness refused to back down. However, police coerced Singh’s older brother into signing documents that closed the case, and the family did not appeal. Kaur does not believe her husband is alive today, but security officials continue to visit her home. In January 1989, Sukhminder Kaur and her family had invited guests to their home for a wedding. Her son, Sarabhjit Singh, was about 17 years old and he was celebrating with the rest of his family. That night, close to 11 o’clock, between 10 and 12 policemen from Bhogpur police station jumped the outer wall of Kaur’s residence and knocked on her door. Kaur remembers that she heard sounds outside but could not tell how many people were at her door. She peeked outside to see who was there and recognized her neighbor. She did not see anyone else, so she opened the door. Suddenly, the team of uniformed men stormed through and demanded to check her place. Kaur’s son and his uncle were sleeping in one of the rooms, and policemen pulled them aside. The police abducted the two men from Kaur’s home and locked her and the rest of her family inside. 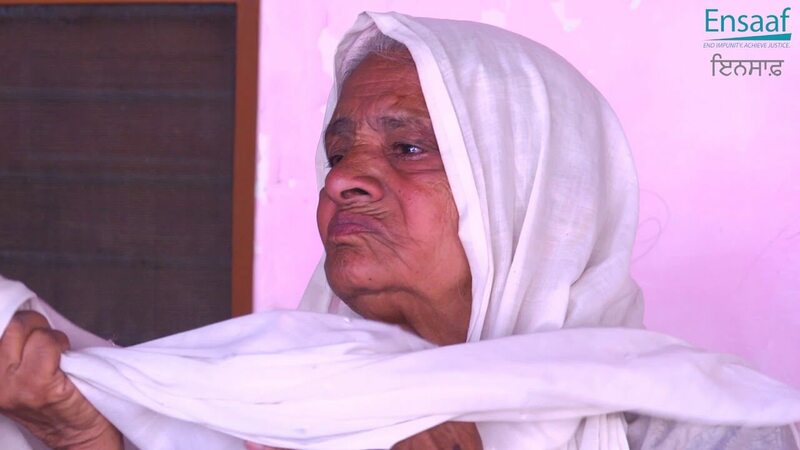 Although the police released her relative a few days later, Kaur never saw her son again. She visited police stations all over the state to search for him, often traveling with her son-in-law or other members of her village. She never found him. A month after police abducted Sarabhjit Singh, Kaur received a letter from him asking her to pick him up from Pathankot station. When Kaur and her family traveled there, the police, however, claimed not to have him in their custody. Kaur and her family have written letters to the Chief Minister and the Governor of Punjab asking for help, but did not receive any information. Ultimately, in an attempt to force the state to disclose the fate of her disappeared son, she filed a petition in the Punjab and Haryana High Court. Twenty-seven years since her son’s abduction, Kaur is still waiting for truth and justice. Thank you so much to all of our supporters who enabled us to make strides in developing the Oral History and Video Testimonials component of our Virtual Site of Conscience. These funds supported the completion of an additional 7 videos. 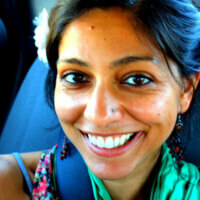 In February 2017, our longtime Multimedia Director Sati Kaur left us after 5 years of service to work on private projects. She was instrumental in developing our video component plans for the Virtual Site of Conscience, and continues to advise Ensaaf as needed. We were fortunate to bring on a consultant who has worked in social justice independent film and assists our Senior Associate in editing video testimonies. On December 20, Ensaaf released another example of its video testimonies here. Thank you for listening to Sukhminder Kaur and continuing to support Ensaaf’s Oral History and Video Testimonial Projects. Please consider making a donation to help Disappearance Videos reach its goal. A donation of any amount goes a long way to support the work being done. Thank you for empowering and fueling the work of the Sikh sangat!